Samuel Beckett’s The Lost Ones (1971/1972) like works by Kafka and Borges, creates a fictional and somewhat fantastic circumstance of constraint and deprivation. He populates a cylindrical space with two hundred abject and languishing humans whose culture seems to be organized according to an elusive order. The narrative agency in The Lost Ones has been described as a disembodied ‘artificial intelligence’ (Schwab, 2000, p.61). One can imagine its denizens as inhabiting a posthuman space, the last vanquished humans secluded in a capsule that is, like a nautilus, organized according to a ‘self sufficient cosmogony, which has its own categories, its own time, space, fulfilment and even existential principle’ (Barthes, 1972, p.65). UNMAKEABLELOVE is a revioning of Beckett’s initial investigation that focuses and makes interactively tangible, a state of confrontation and interpolation between our selves and another society that is operating in a severe state of physical and psychological entropy. UNMAKEABLELOVE advances the practices of algorithmic agency, artificial life, virtual communities, human computer interaction, augmented virtuality, mixed reality and multimedia performance to engage ‘the body’s primordial inscriptions’. It locates Beckett’s society of ‘lost ones’ in a virtual space that represents a severe state of physical confinement, evoking perhaps a prison, an asylum, a detention camp, or even a ‘reality’ TV show. While in UNMAKEABLELOVE the inhabitants of the cylinder remain oblivious in their condition, and we the viewers of their world, with our probing torch lights and prying gaze, are positioned as the ‘other’, forced to experience the anomalies of a perceptual disequilibrium that implicates us in this alienated narrative. The resulting ambiguity and complicit agency in UNMAKEABLELOVE reinforces a perceptual and psychological tension between ‘self’ and ‘other’ generated by the works’ mixed reality strategies of embodied simulation. The technological infrastructure of Re-Actor is a five-meter diameter hexagonal construction with six rear-projected screens and stereoscopic 3D viewing using twelve projectors, passive Polaroid filers and glasses. UNMAKEABLELOVE in Re-Actor offers a physically immersive three-dimensional space of representation that constitutes an augmentation and amalgamation of real and virtual realities. It is a hybrid location-based manifestation that operates both as an individual and socially shared experience, and its interactive modalities of operation incorporate the kinaesthetic dimensions of human apprehension to establish a congruence of human and machine agency. UNMAKEABLELOVE uses six torches, mounted in front of these screens, to enable the visitors to peer into the virtual world. The virtual light beams generated by these interactive torches intersect and illuminate the computer-generated figures that inhabit its virtually represented interior. Beckett’s text, scientific in its exactitude, is capable of being analyzed and coded into software algorithms that computationally animate virtual representations of his characters. In UNMAKEABLOVE these virtual representations then become the seemingly self-motivated narrative agents of Beckett’s scenario. The world of UNMAKEABLELOVE consists of the Searchers always active and searching in vain; the Sedentary who are no longer move around and are only occasionally roused from their lethargy, and the Defeated for whom all hope is gone, slumped and vaguely stirring in the perimeter of the enclosure. Each group with their specific behaviors is largely confined to particular zones inside the hexagonal space and permitted occasional interactions, moving between zones and at rare junctures switching identity. Now and then they beat themselves, or examine each other looking for the birthmarks of identity, and very rarely they collide in frenzied sexual encounter. Violence sporadically breaks out, it’s muted thuds audible in the rustling of their dry skin that permeate the audible world. In his prose work The Lost Ones, Samuel Beckett he describes a community of about 200 people who inhabit a cylinder that is 50 meters in diameter and 18 meters high. In UNMAKEABLELOVE this community is scaled down to 30 characters that inhabit a hexagonally shaped room that is 5.5 meters wide and 3.5 meters high. To reflect the body:space ratio that Beckett proposes, its characters are reduced to approximately half life-size. Three actors created over 300 motion captured sequences that became the primary resources for the real-time behaviors of the characters in UNMAKEABLELOVE. Each character is a 12,000 triangle polygonal model with a 1024x1024 texture and is animated by a 53-bone skeleton. Motion capture was used to create the animations, with additional finger animations added afterward by hand. Real-time rendering of the characters using the XNA engine allows for dynamic lighting, controlled by the viewers. 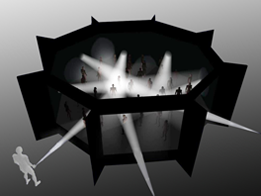 Six volumetric light beams, casting shadows onto each other and the environment, light the characters. Un Volcan Numérique, The Digital Volcano, Le Volcan, Le Havre, France. Developed with the generous support of Museum Victoria, the UNSW iCinema Centre and EPIDEMIC.